Razia came to live in Duxberry in 1970’s, she is a Rotary member, once serving as president. Razia was a tailor shop owner. After 911, she rallied her community to send over 400 blankets to rescue workers. Her handmade quilts commemorating September 11 have been exhibited at Madison Square Garden, the Pentagon and fire stations in NY and Mass. She also coordinated delivery of 30,000 pairs of shoes to Afghan children. 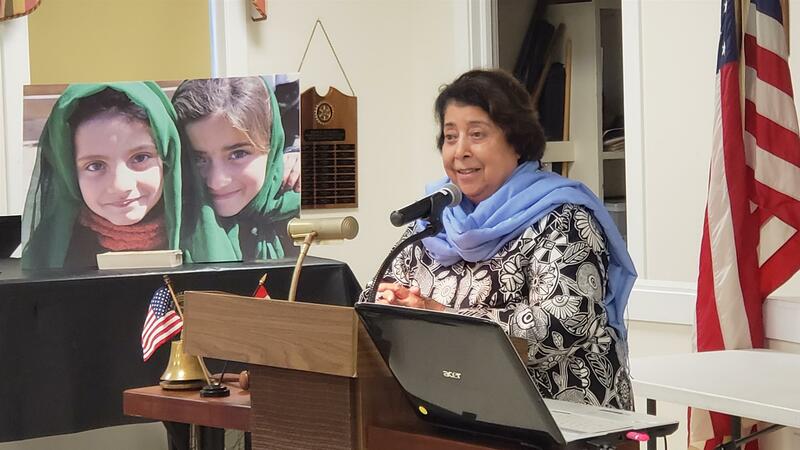 Due to wars and Taliban, Razia could not return to her home country of 38 years, once she arrived, she witnessed many changes in Afghanistan. One of the most disturbing was the treatment of young girls. Killing of afghan women. Razia decided to build a school for girls. She asked for help in raising money, in one night, with the assistance of Khaled Hosseini (author of the ‘The Kite Runner’), raised $75,000. Razia had great difficulty with the men in the community, some trying to stop the construction of the school, but they prevailed and the school was opened. This year is the 10th anniversary of the school, the graduating classes increase in number each year. When the first 7 girls graduated, they were not allowed outside the village, so Razia raised money to build a college next to the girl’s school. 20 young women will graduate this year. Scholarships provide students with uniforms, materials and education. The school is heated, uses solar panels and has computers with internet. These tools have helped 11 of the young women to attend US universities. There are 300 girls on a waiting for 2021. It is very dangerous for these students, everyday rooms, food and water supplies are checked for poison and gas. Even with all the issues, the school has impacted the community in positive ways, changing the community. There is hope that the graduates will return one day to teach in the schools. 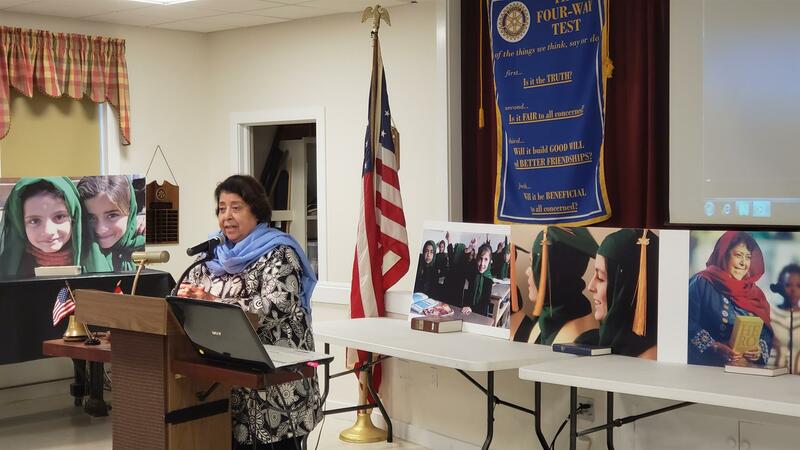 Razia believes that it is amazing what a Rotarian can do anywhere in the world. She is asking for financial assistance from everyone, most of the funding and support is coming from Rotarians.